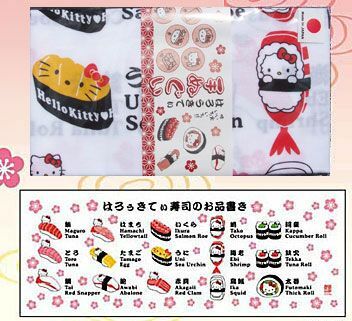 Hello Kitty Sushi Menu Tengui covered with lots of different, yummy sushi. Great for learning and remembering sushi names. Each sushi has it's name in Japanese, english and a description in english. Measure 35 x 90cm. *Tengui is a thin Japanese hand towel made of cotton. It can be used for anything a towel could be used for - as a washcloth, dishcloth, headband, souvenir or decoration. Looks great on a wall or as a table cloth too! Made in Japan.